Born on a farm near Augusta, Maine, W. Herbert Dunton became a leading American illustrator and renowned painter in the early art colony of Taos, New Mexico. His specialty was painting the untamed West before it disappeared. Especially helpful to his career was the patronage of Texans Nelda and H.J. Lutcher Stark whose collection founded the Stark Museum in Orange, Texas. They bought hundreds of Dunton’s paintings during the Depression because his renderings of animals and landscape greatly appealed to Texans, and their Dunton paintings became the largest collection in America by that artist. When he was a youngster, Dunton spent much time roaming the woods and fields around Augusta with a gun and sketch-book, and by the time he was sixteen, he was selling drawings and stories of outdoor life to local newspapers and to the Boston Sunday Globe. Dunton’s family encouraged his obvious art talent by giving him materials and freeing his time from farm chores. At age eighteen, he went to Montana for a lengthy period and sketched big game, and from that time, frequently returned West, often working as a ranch hand. He also went to Oregon and Old Mexico where he worked on cattle ranches and collected frontier artifacts. 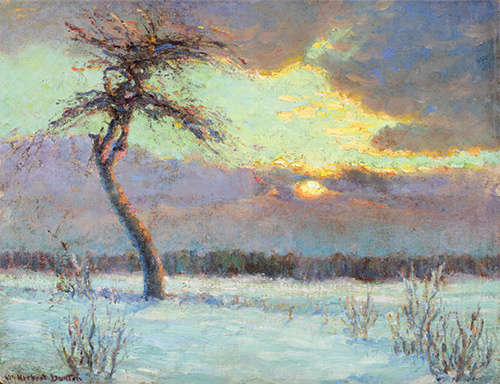 He studied art in Boston at Cowles School and in New York at the Art Students League, and his teacher and fellow Salmagundi Club member Ernest Blumenschein invited him to Taos, New Mexico. In 1912, he opened a summer studio in Taos and settled there in 1921. Meanwhile he had become one of America’s top-ranking illustrators, with a specialty of lively western outdoor scenes, often showing dramatic episodes such as galloping cowboys to avoid a cloudburst. Some of his best-known illustrations were of Zane Grey novels, but from the time of his move to New Mexico, he accepted few illustration commissions. In New Mexico, he became one of the founders of the Taos Society of Artists, whose purpose was promoting sales of the local painters. Unlike many of his Taos peers, he focused on subjects other than Indians and landscape and often portrayed cowboys, animals and the vanishing frontiersman. One of these subjects was Frank Riley, a sheriff of Pima county, Arizona, whom he painted in 1913.